Engaging Media How can we bear witness to Jesus Christ in the globalized media? 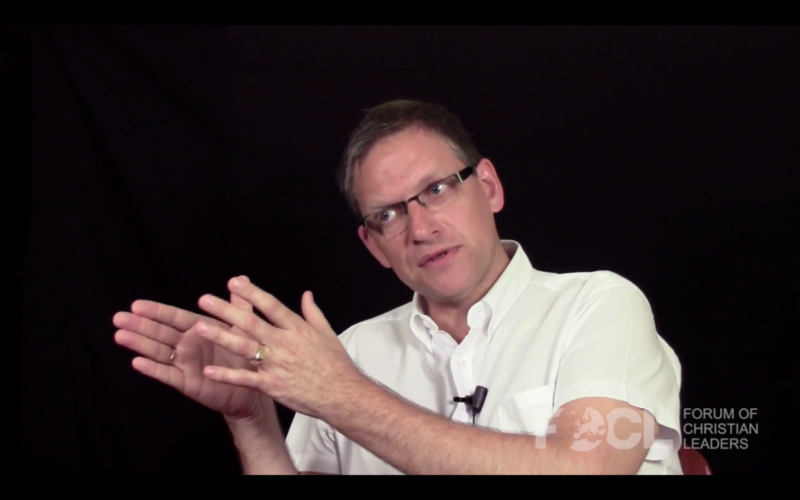 Lars Dahle, Lausanne Catalyst for Media Engagement, talks about what it means to bear witness to Christ in a globalized media context in three key dimensions. This video was recorded at the European Leadership Forum in 2014, and is republished from the Forum of Christian Leaders. As Christians, we live in a media-saturated world – in a globalized media world. And as Christians, we are called to bear witness. That is actually a very rich concept. It comes from John’s gospel: to bear witness to Jesus. It means – it’s an all-inclusive concept. It includes words [and] our life. It’s a concept from the court: it’s a legal concept of bearing witness to. That means we’re not hammering people over the head about Jesus. We are actually introducing who Jesus is – presenting the case, which is really a much more gentle approach and much more sophisticated approach than what people think about arguing, if arguing is seen as as a hard way of approaching it. It’s a much more richer approach. So bearing witness to Jesus means that as we are as human beings – as witnesses, as disciples of Christ – we are called to do that, and to do that in in three dimensions. And I’m quoting here the Cape Town Commitment. That is a very important document that came out of the Cape Town Congress in 2010. The Lausanne Movement was started by Billy Graham and John Stott in 1974 and the third global congress was in 2010, and out of that came the Cape Town Commitment. In the forward to that, the focus is on bearing witness to Jesus Christ and it is really relevant to the world of the media because it talks about, we are called to bear witness in three dimensions. I’ve recently written on this and called it ‘Mission in 3D’ – mission in three dimensions. The first dimension is bearing witness in every nation, and if we are today to bear witness globally across the borders – you know, that’s the classical definition of mission: moving with the gospel across geographical, ethnic, cultural borders – we have to use the media. There is no way we can reach people where they are if we ignore the world of the media. So we need to use the media in any and every way – media technology which is available to us to share the gospel in every nation. That’s the first dimension of bearing witness. The second dimension is bearing witness to the truth of Jesus Christ in every sector of society. And since media is all pervasive, since media is everywhere, we need to be concerned about bearing witness to Jesus where we are – including in the area of media. In the social media sphere, it’s a wonderful possibility of being naturally open, transparent about belonging to a church, for example; talking, sharing on Facebook or whatever would be the appropriate arena about going to church, about what Christian faith means to us. So we are called to bear witness in every sector of society and every sphere of society, which includes our workplace as well. And of course increasing the media affects the workplace as well – if you think of media in in terms of digital technology, in terms of media messages. And then finally, the third dimension: bearing witness in every nation, in every sphere of society, and in the realm of ideas where ideas are shaped and formed, and that happens in the educational system, and it happens in media. Now we need to really take this seriously. We need Christians to to enter into the mainstream world to shape these scripts, which I talked about – the scripts that are presented to us. So there is a wonderful opportunity there for Christians to enter the mainstream media to help us understand the world in a richer, more adequate, more comprehensive, more biblical way.